Pipe clamp "faces" why so small? I have many pipe clamps, use them frequently, and am happy with them. I know, they are heavy. That doesn’t bother me too much, but what I was wondering is if there were a way to increase the “face” size, the clamping face of pipe clamps. I know, it would have been done, but the weight becomes an issue. Still, anyone out there jerryrig something to increase the face size while maintaining consistent clamping pressure across the face? I would love to see solutions, if they are out there! I don’t have any pipe clamp mods to recommend, but parallel clamps would certainly work. I like Bessey “H” style pipe clamps for panel glueups, and Bessey K body parallel clamps for carcass assemblies. Increasing the face size reduces the pressure your clamp is capable of, just by spreading the force over more square inches. 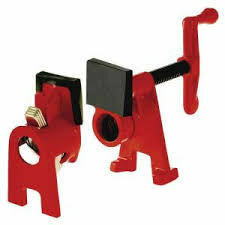 So it is a compromise but you can surely add wood pads to the clamp jaws. Thanks pintodeluxe, I love the parallel clamps, just have a hard time with the investment. Bondo, thanks for the information on the information. I get it now. I always thought it was a weight issue. I have….and still use pipe clamps for more than forty years and have never had a need for more surface area…..WHATS REALLY GOING ON ? Yep, wood pads. I just use some double-sided tape to hold them in place but you could make some that have a hole for the pipe and slide along with the heads. I also made wood pads out of a softer wood like pine to prevent denoting of my project. Dwain, I was more concerned with stability but my solution also makes for a wider face. For Jorgensen style, 3/4” pipe clamps, I cut 3/4” MDF triangles 2” wide at the top, 5” long and 3” wide at the bottom. Drilled a 7/8” hole for the pipe. On mine, there are two small holes for screws on each clamp head and tail piece. Used those to secure the MDF to the clamp. I’ve used these clamps and pads for several years and, they still do the job. These are the ones I use, and frequently recommend. They provide a good elevated surface for panel clamping, and even the 1/2” pipe versions are quite stout. Maybe the clamping surface is bigger than other pipe clamps? Not sure. The best part is they are dirt cheap and readily available. They include nice rubber pads that always seem to stay put. Similar idea here. I got a sheet of cork (a bit over a sixteenth thick) at a craft store and glued it like veneer to some 3/4 “ plywood. Cut it into various size blocks to use with all sorts of clamps. They help spread the pressure and really protect the work piece. I have some that are about 2” x 12” that I use in the jaws of my vise when I need extra protection. I also use wood pads made of what ever I have on hand. I cut them only slightly larger than the pipe clamp casting face and glue them on with epoxy. Occasionally one will break off and i just glue it back on or make a new one. When gluing them on I apply the glue and the wood pads and then tighten the clamp to something square until the glue has cured. This fixes the pads in proper alignment for future use. Say that this was a joke, pleae.